Perhaps you have a portfolio of mutual funds that is valued at $100,000. Or you may own a single stock of that value, or a collection of equities and bonds. You have decided to give this as a gift to charity or charities while you live or at your death. 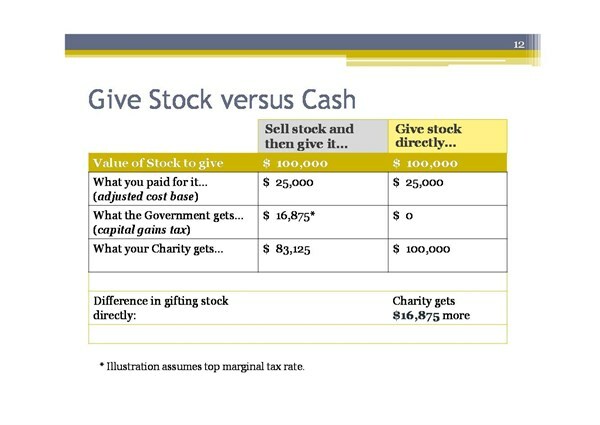 You must choose whether to sell the portfolio and then give the cash, or to give the portfolio directly to the charity. There is a resulting difference! In the example above it is assumed that the original cost of the portfolio, regardless of its composition, is $25,000. If it was sold first, the donor would incur a capital gain that might result in a $16,725 tax bill. That means the charities would receive the net $83,125. The donor would receive a donation receipt of $83,125 for use towards a tax credit. However, if you donate the stock or bonds or portfolio directly to the charity through a transfer, they would likely liquidate it immediately and thereby receive a full $100,000. The Canadian government allows the capital gain to be eliminated on such a transfer, a blessing to the donor. Also, the donor receives a donation receipt for the full $100,000. The decision to give the portfolio directly rather than to liquidate it and then give a cash give is a WIN / WIN for both the donor and the charities involved. If you would like to give your appreciated stock to more than one charity, why not consider asking CNCF to facilitate the gift. You can distribute it according to your wishes.